For much of Japan’s history a person’s lifespan would generally did not exceed 50 years. When the famous warlord Oda Nobunaga (1534-1582) committed suicide at Honnoji temple in Kyoto, he recited his favorite Noh verse, “Man’s life lasts 50 years--- compared with the lowermost tier of the heavens, it is but a dream and illusion.” Surveys of the late Edo period (1603-1867) indicate the average life expectancy was around 50. The average life expectancy in Japan in 1900 was 44 years. By 2050, the average lifespan of Japanese women is expected to exceed 90 and women over 65 will make up 25 percent of the population. One study predicted that in the year 2300, the average Japanese would live to the age of 106. In 2007, Japanese women were the world’s longest-living people for the 22nd year in a row with a life expectancy of 85.83 years. Japanese men had a life expectancy of 79 years, placing them in second after dropping to forth in 2005. In 2005 the average age of both sexes declined slightly, a reflection of number of flu-related deaths that year but 2006 saw them return to their record-breaking ways. Countries with the highest average number of years of good health, according to World Health Organization study in 2003: 1) Japan, 75 years; 2) Sweden, 73.3 years; 3) Switzerland, 73.2 years; 4) Italy, 72.7 years; 5) and 6) Australia and Spain, 72.6 years; 7), 8) and 9) Norway, Canada and France, 72 years; and 10) Germany 71.8 years. High life expectancy in Japan is the result of a low-fat diet and low rates of lung disease. It is increasing as a result in reductions in smoking, campaign against AIDS, treatment methods for cancers and strokes and drops in automobile accidents. However, Japanese are eating more fatty food and recording higher rates of obesity, heart disease and diabetes and experiencing higher rates of lung cancer. Among developed nations, Japan has a relatively high accident rates for infants and elderly. 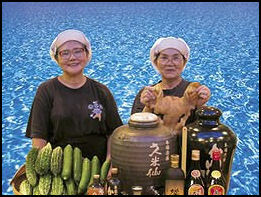 Good food and good eating is equated with good health and a happy family life in Japan. Both home cooking and meal times, seen as “occasions for family communications,” are valued. Fish, rice and seaweed are important staples, vegetable oil is preferred over animal fat. Shokuiku (“teaching the importance of healthy eating”) is stressed in classrooms on primary and middle school. Eating guidelines recommend consuming “30 different foodstuffs,” with an emphasis on fruit and vegetables, each day. In May 2006, scientists at Tohuku University in Japan concluded that a traditional Japanese, fish-based, low-fat diet is healthier than an American diet based on a study in which 21 typical foods from each country were freeze dried, ground into powder and then fed to eight mice for a period of three weeks. American food items including hamburgers and fried chicken while Japanese items included sashimi and rice porridge. Mice fed Japanese food had lower cholesterol levels and recorded higher activity among genes that break down cholesterol. Fat accounts for less than 20 percent of the calories in the Japanese diet, compared to nearly 40 percent in the American diet. Advanced tumors are six times more likely in the United States than n Japan. Japan has a low fiber intake and a high constipation rate compared to other countries. The Japanese have traditionally eaten a lot of fish. In 2000, the American Heart Association recommended that people eat salmon or tuna twice a week. It was the first time the group recommended eating specific things rather than offering general guidelines. Studies have shown that eating oily fish can significantly reduce the chances of getting a stroke, developing prostrate or breast cancer, suffering from depression or being stricken by a sudden, unexpected death caused by a severely abnormal heart rhythms. Eating fish has been linked with low cholesterol levels and low rates of heart disease. Oily fish such as salmon and tuna are in rich fish oils, which in turn are rich in omega-3 fatty acids, an essential nutrient in the human diet. There is evidence that omega-3 fatty acids prevent inflammation, clot formation and clogging of blood vessels with fat and cholesterol and that a lack of omega-3 fatty acids may play a role in a variety of maladies, including bipolar disorder, heat arrhythmia, high blood pressure, heart disease, kidney failure, irritable bowel syndrome and rhomboid arthritis. Omega-3 and omega-6 are essentially fatty acids that work together to promote good health, The human body can not make them so it is essential that people eat diet rich in them. Omega-3 are found in fish and certain oils such as canola and flaxseed and omega-6 are found in raw nuts and seeds. Omega-3 fatty acids are found in sardines, salmon, herring and some kinds of tuna. Shrimp, some kinds of tuna, haddock, clams, cod, and crab are low in Omega 3s. Omegas 3s are also found in wild game, nuts like almonds and walnuts and avocados. With the absence of Omega-3s the body uses saturated fat to make cell membranes. Cell membranes made with this type of fat are less elastic and a lack of elasticity can be dangerous to the heart. Studies have also shown that eating fish rich in omega-3 fatty acids cuts the risk of stroke and cancer. A Finnish study published in the journal Neurology in August 2008, researchers found that older adults who regularly ate fish had a lower chance of developing subtle brain damage that contributed to stroke and dementia. A study by Dr. Mich Brown of Paterson Institute at Christie Hospital in Manchester England published in the journal Cancer in March 2006 found that eating foods rich omega-3 fatty acids could help prevent the spread of prostrate cancer. Eating fish can reduce irregular heart beats. In a study conducted by Bingham and Women’s Hospital and Harvard Medical School, regularly eating tuna or broiled or baked “but not fried---fish reduces the risk of atrial fibrillation, a major cause of stroke and other problems. Scientists credit the Omega 3s in the fish. There is also some research that suggests that mothers who eat Omega 3s while pregnant produce smarter children and that people who get angry easily can better control their tempers better if they eat them. A study by American and British researchers published in Lancet in 2007 reported that children of mothers who ate small amounts of fish when they were pregnant gave birth to children who had lower IQ and academic test scores and had more social and behavioral problems than children of mothers who ate 12 or more ounces of fish per week. Other studies have indicated that women who don’t get enough omega-3 fatty acid are more likely to deliver babies too early and at a low birth weight. Hello Kitty popcorn Almost the entire population of Japan has high methymercury levels---thought to have come from tuna and other fish---that are above U.S. Environmental Protection Agency limits. The obesity rate in Japan is 3.6 percent compared ro 32 percent in the United States. When Japanese move to the West their rates of chronic diseases like diabetes and heart disease go up. Some have linked the trend to eating more meat and less soy bean products. Changing eating habits---namely consuming more meat, cheese and fat-rich Western foods---has been accompanied by higher cholesterol levels and rates of heart disease and other illnesses. There are currently 8.2 million Japanese with diabetes, double the number in the early 1990s. The rate is expected to reach 10 million in the next ten years and become a strain on the national health care system. Research by Hiroshi Shimokata of the National Center of Geriatrics and Gerontology in Obu, Aichi Prefecture released in February 2011, indicated that women in their 30s and 40s were getting thinner. According to data from about 200,000 women the percentage of women in their 30s deemed underweight increased from 15 percent in the 1980s to 22 percent in the 2000s and the percentage of women in their 40s deemed underweight increased from 7 percent in the 1980s to 17 percent in the 2000s. Women who had a body mass index of less than 18.5 were said to be underweight. A survey by the Japanese health ministry in 2009 and 2010 found that 2 percent of girls in Japan have eating disorders. “Popular diet trends maybe endangering our children. The number of potential sufferers could grow several-fold,” the survey leader said. A big deal is made in Japan about metabolic syndrome---a grouping of risk factors for developing heart attacks, and cardiovascular disease and diabetes that includes high cholesterol, high blood pressure, elevated triglyceride levels, high glucose levels, low levels of “good” HDL cholesterol and abdominal obesity---after a study found that half of all men between the age of 40 and 74 and one in five women show signs of it. In some places people are diagnosed with the condition based solely on their waist size regardless of their height and weight. The report shocked the nation and the government responded with legislation to identify “metab” and get Japanese to get in better shape and encouraged Japanese companies to get involved. One regulation that took affect in April 2008, required all citizens over the age of 40 to have their waists measured with men with waists exceeding 33.5 inches and women with waists over 35.5 inches considered at risk and referred to counseling and close monitoring. As part of the regulations companies are required to slim down their workforce or pay high insurance premiums. In response some companies have begun offering employees deliveries of healthy foods like brown rice, started offering “lifestyle instruction courses, offering “healthy menus” in company cafeterias to their homes and begun sponsoring retreats for overweight employees to help them trim down with lectures on diet, exercise and Zen mediation. A number of products have been introduced to help people slim and lose weight. Among the most popular are devices that count how far a person walks everyday and calculates what their caloric intake should be. In many cases determining whether someone has metabolic syndrome is determined by simply measuring their waist. Men with abdominal girths of 85 centimeters or more and women with abdominal girths of 90 centimeters or more are said to have the condition. The practice of determining whether someone has metabolic syndrome based solely on measuring waist size has been called into question. In February 2010, the Japanese health ministry said that using the waist measurement standard to judge whether a person has metabolic syndrome had no scientific basis. Also, an increase in metabolic syndrome tests has come at the expense of cancer testing. One survey has shown that has the number of people getting metabolic syndrome tests has increased the number getting cancer tests has shrunk. A survey by the government health ministry in 2009 found that 40 percent of women who had undergone pregnancy experienced miscarriages, a much higher rate than was assumed.